6 WEEKS TO SPEAKING SUCCESS! 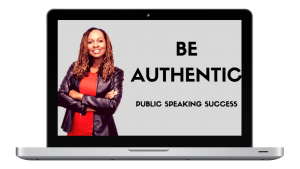 An easy-to-use system to help you build confidence, wow your audiences and be YOU on stage. Maybe you’ve done some public speaking before but you don’t have much training and worry that you’re not doing it ‘right’? Do you want to experience joy on stage, rather than anxiety? Would you’d love the freedom to be yourself in front of an audience? Maybe you’d like to feel confident, in control and poised as a speaker…to enjoy every moment of your talk and be fully present to your audience, rather than feeling that you can’t wait to get out of the spotlight. I share with you the exact strategies and frameworks I use personally, and that have helped thousands of speakers. I share my personal secrets and advice from speaking to and performing for thousands of people worldwide over the past 10 years. We’ll work through 6 modules together. Introduce you to three popular storytelling frameworks that you can use during your presentations. This will enable you to inspire your audience and to connect with them. Show you how to use language and questioning techniques to draw in your audience and help them feel included in your talk. Explore the power of personal stories and how vulnerability leads to connection and inspiration. tell meaningful stories that increase the know, like and trust factor. Have you ever been in the situation where you’ve been asked to ‘say a few words’ and you’re stumped? Or you’ve turned down an amazing opportunity to speak because you didn’t feel prepared? Baby, those days are over!! 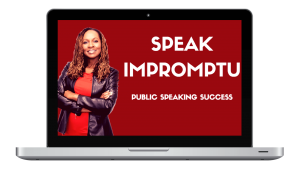 Understand how to expand upon a subject when public speaking, even when you don’t have a great deal of knowledge on it. You also have access to 3 hours of bonus content! In this bonus module we explore a variety of ways for you to stay on form and keep your content top of mind when you speak. How do you stop your mind going blank? Are you better off using bullets or learning your talk word for word? What’s the technique that memory experts love? All this good stuff and it’s not even a core module! Choose the techniques that work best for you and your personality. I’ll be your coach and cheerleader. I know first hand that it can be a challenge to step up and speak on stage. Years ago I hated public speaking and was dreadful at it. These days I’ve performed on 4 continents and spoken to groups as large as 1500. I share my best insights, strategies and tips with you. 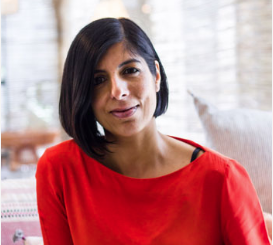 I’ve written two books on public speaking and trained at events on behalf of Harper’s Bazaar and major corporations as well as running my own successful London speaking workshops for women. There’s also a 15 day guarantee. Show that you’ve logged on and completed 2 modules and if you’re not happy, (how on earth this could be the case I can’t fathom) you’ll get a refund. 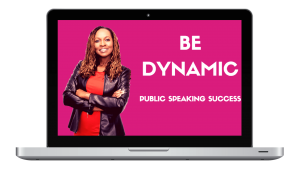 Become a confident, powerful speaker today. Thousands of online students have taken these modules. The content is to-the-point, practical, and after every video lesson there’s an activity to help you implement what you’ve just learned. Learn the same techniques I use regularly as a professional keynote speaker and trainer. There’s a 15 day money back guarantee. Show you’ve completed 2 modules as well as the written exercises and we will refund your money. Before you make your mind up . . . let’s hear from a few happy people! 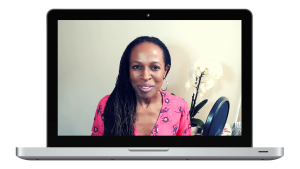 Shola is a talented speaker and delivers her content in an engaging way. She shared different techniques with us that we could practice which meant we all left with new (or improved) skills. I was so impressed by Shola that I have asked her to do some training for the women on my mastermind. 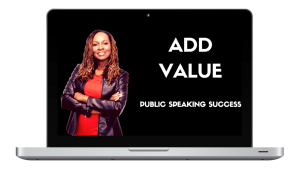 Training with Shola is a pure joy, she is a true expert at public speaking and has a wonderful way of training you which is fun and effective, you really do learn so much and in such a safe environment, the results ‘speak’ for themselves. I have now secured my first speaking engagement. 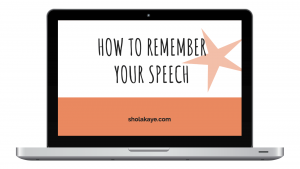 The reason I am endorsing Shola Kaye is that I now I have the tools, feedback and knowledge of how to put together a talk that will be engaging and potentially client attracting too. 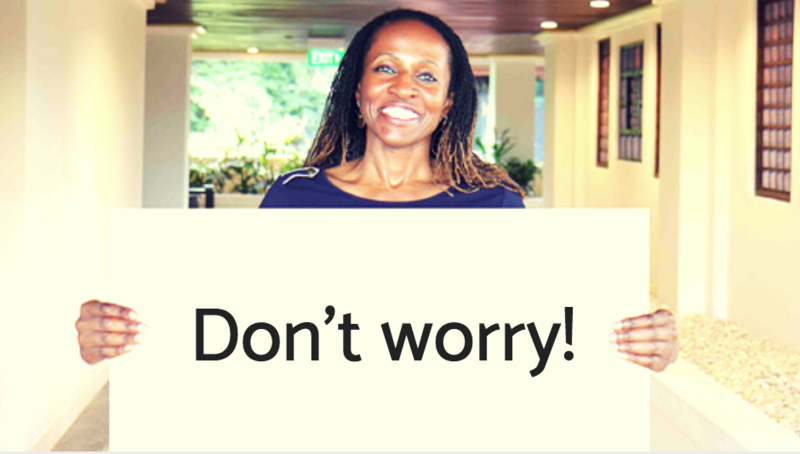 Thank you Shola Kaye your approach has made a big difference to me and how I create my talks going forward. I wanted to email you to say Thank you! I have been speaking for many years on & off and wanted to focus on how to really bring out my best qualities as a speaker and trainer. I have found your course to be really quite outstanding with the results I have achieved since studying this particular material just a few months ago, to helping me speak from the core of who I really am. For example: your ideas and strategies on how to be an authentic speaker have helped me to be quite successful at contesting in Toastmaster International Evaluation Contests and your course inspired me to successfully win through all the rounds of the club, Area, Division and straight through to the National District Finals in Hobart, Australia in May this year, 2018! I was also able to be successful in my public speaking and training abilities during my own specialist workshops. Your course, Shola, has really helped me achieve this tremendously by bringing out my authentic self in all that I do. I bet you’re a bit like me . . .
You want to make sure that this course can genuinely help you and that the trainer knows her stuff. Formal qualifications are far from everything, but when you’re trying to make a buying decision that could change the course of your business, your career or indeed your life, every extra bit of information helps. I’m a fully qualified teacher with a PGCE from Oxford University and I won a teaching award from the Royal Society of Chemistry. I pride myself on clear, no-nonsense explanations and a practical, accessible teaching style. I have an undergraduate degree from Cambridge University and a Masters degree from Emory University in the USA. I’m also an NLP practitioner. 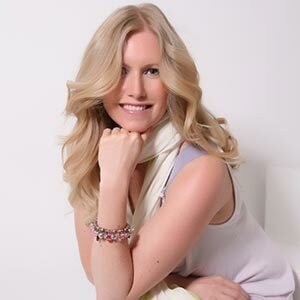 I trained with Joanna Martin, known worldwide in the world of speaking to sell. And I have many years of training for both speaking and singing. 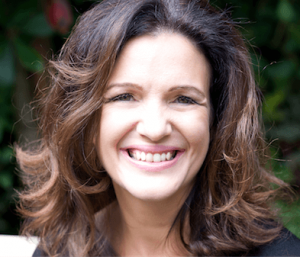 I won the Jenny Seagrove speaking award for getting the top mark worldwide in a Speaking for Performance exam and have trained 1000s of people online from all over the world. Most importantly of all, I speak regularly, with confidence, impact and authenticity. In this course I show you how to do the same. I want you to enjoy this course and come back to it again and again because of the depth of information it contains. There are two types of people in this world…those that take action and those that don’t. I LOVE to coach and train people who know what they want and are prepared to roll up their sleeves and do the work to get it. Of course, life holds no guarantees…but don’t forget your 15 day guarantee that comes with this course. Show that you’ve logged on and completed 2 modules and if you’re not happy, you’ll get a refund. 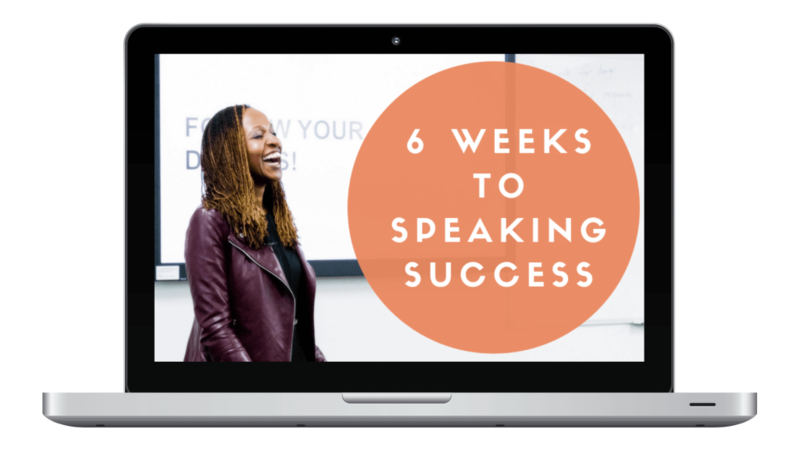 Who is 6 Weeks to Speaking Success for? 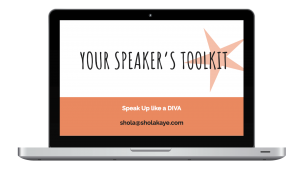 It’s for anyone that wants to be a better speaker and feel confident on stage. The course is a complete system to help you achieve this, and more. If you have an extreme speaking phobia and are looking or a way to lose your fear, then this may not be for you. Most people experience fear because they are worried about being judged or because they haven’t prepared properly. If that’s you, then yes, this course is perfect as it encourages you to be yourself confident self on stage and to prepare in good time. 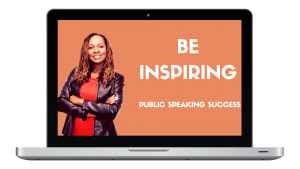 This course is great for newbies as this system takes you through the entire process needed to be an accomplished speaker. Select the tools and techniques that will help you most as you get started, and add to these over time as you build confidence and expertise. The content will help you overcome basic nerves and fears so you can be confident and enjoy your time on stage. I’m a seasoned speaker. How can you help me? Seasoned speakers have found this content extremely helpful. One of my course students, who had been speaking for more than 8 years, found that the module on Authentic speaking helped him greatly, so much so he got through the final round of a national speaking competition! He credits this content as the reason he did so well and says it has also helped him grow his business. You have lifetime access to the course content and as soon as you enrol all the modules will be available to you. We don’t force you to do a module at a time by drip-feeding them to you. The entire course is available online and you can access it anytime, anywhere. There will be no physical products sent to your address. Each module is approximately 45 mins to 1 hour in length. There’ll be activities to complete that will help you become a better speaker and you can complete the modules in any order. If you get through one module a week, which is more than possible for most people, then it will take you 6 weeks to complete. 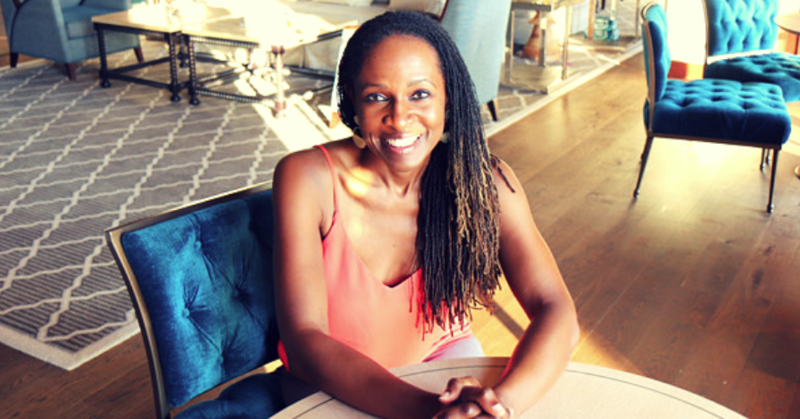 Drop an email to us at admin@sholakaye.com and either Karen my VA, or Shola will answer your questions. Just put 6 WEEK SUCCESS in the subject line of your email.